This table consists of a finely figured mirror veneered walnut top with cross grain banding and rounded corners leading down to a figured walnut veneered shaped frieze also with rounded corners to the front. The table is supported by four finely carved cabriole legs each with a finely carved scallop shell and husk decoration to the top terminating with finely carved ball and claw feet. The table top opens up as a card or games table, displaying an unusual and wonderful quality original piece of needlework instead of the more common baize, this is in excellent condition for age and consists of a floral border with silver thread to the outer edge with a central design of playing cards, counters and flowers. The table has four yew wood circular corner candle holders and four yew wood oval guinea wells. 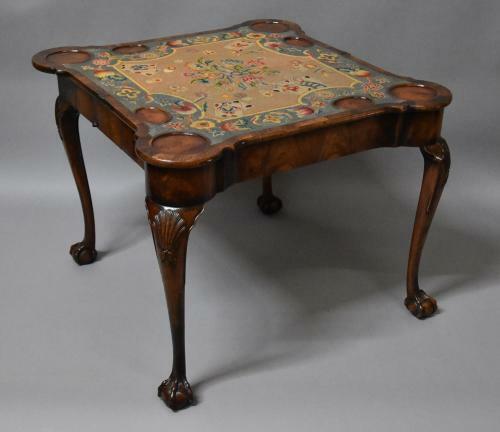 The candle holders have been included in the design of this table to keep the design authentic to a table from the Queen Anne period (early 18th century), although probably not necessary as candles were being used less as electric light was more commonly used.